Though Nihon Falcom’s Ys (pronounced 'ease') has been sending gamers off on action-RPG adventures since 1987, you’d be forgiven for not being familiar with the series, with the last mainline release on a Nintendo console being the Japan-exclusive Ys V in 1995. Since then, Ys has seen something of a renaissance on PlayStation consoles, with 2010’s Ys Seven on PSP, 2013’s Ys: Memories of Celceta on PlayStation Vita, and 2017’s Ys VIII: Lacrimosa of Dana on PlayStation 4 and Vita all releasing to critical success. Luckily for Nintendo fans, NIS America has now brought this last Ys title to Switch, and we couldn’t be happier; with its quick, engaging combat, memorable characters, and a uniquely beautiful world to explore, Ys VIII is a fantastic RPG and a perfect fit for Switch. Ys VIII kicks off aboard the great ship Lombardia, a proud passenger vessel taking Adol Christin and his friend Dogi across the Gaete Sea to Eresia. While you’ll get to experience the elegance of high seas travel briefly, things quickly turn, and it’s not long before an enormous kraken attacks and sinks the ship, along with seemingly everyone onboard. 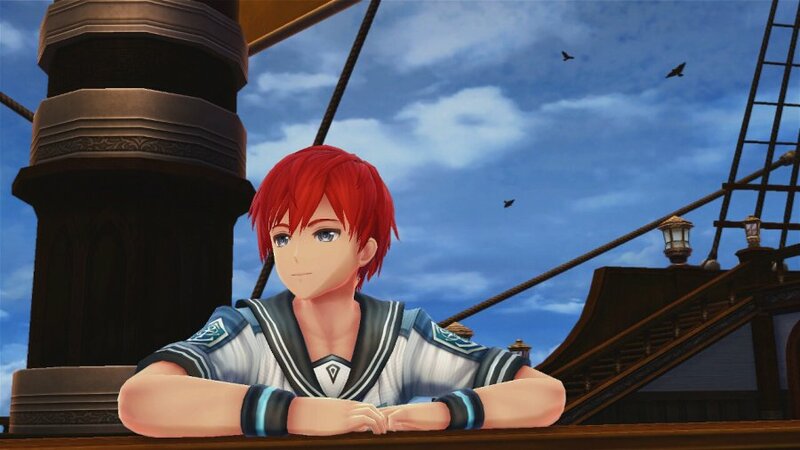 The next time we see Adol, he finds himself washed up on the shore of a mysterious, tropical island — the cursed Isle of Seiren. As he starts to explore, he begins to find other castaways from the Lombardia, and after assembling a party of unlikely adventurers, sets out to rescue the rest of the survivors, unravel the mystery of the island, find a way to escape… and figure out how a young woman named Dana from his dreams fits into his predicament. While it leans on plenty of familiar plot lines and anime clichés, Lacrimosa of Dana’s story is still genuinely interesting, and its island-bound scale helps keep the narrative grounded even as it veers into more fantastical territory. The likable characters go a long way towards holding interest, and the interactions between them become a real highlight as you grow your makeshift settlement of castaways. It’s also a particularly well-paced adventure — like many Falcom games, it feels more like a novel in terms of structure than most RPGs, with quick-moving plot points that still leave plenty of time for detail and world-building. 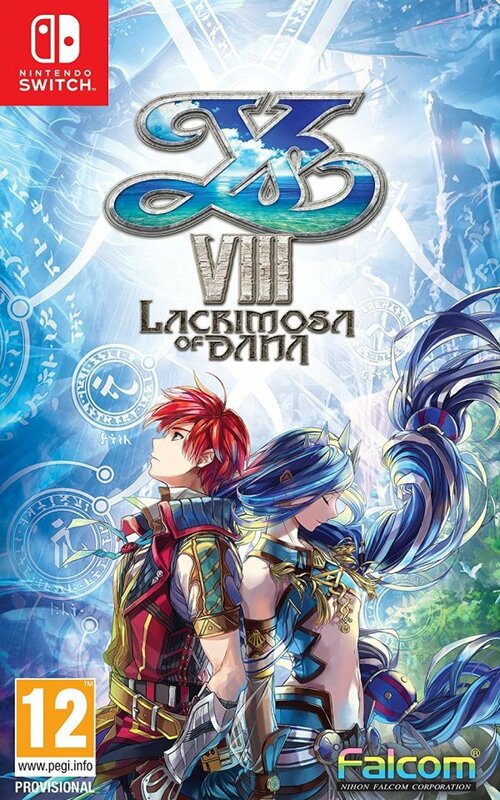 It’s worth noting, too, that even though it has ‘VIII’ in the title, Lacrimosa of Dana works just fine as a standalone experience; like Final Fantasy or Dragon Quest, Ys games are more about a connected universe than sequential stories. Unlike Final Fantasy or Dragon Quest, however, Ys has been about active battling from the start, and Ys VIII is no different. Combat in Lacrimosa of Dana is real-time and takes place directly on the field, without switching to any separate screen. Foes frequent Seiren’s shores, and as soon as they’re in range, you can start wailing on them using the fast-paced hack-and-slash system. You’ll attack with ‘A’ — with multiple hits of the button stringing together automatic combos — and use skills by holding down ‘R’ and pressing a face button to call any of the four assignable skills you’ve set, while ‘L’ performs a quick dodge, and ‘R’ blocks. 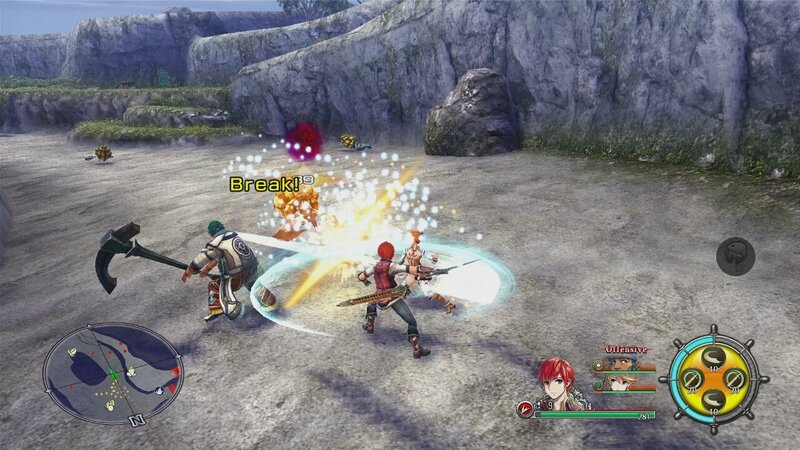 You can switch between your three active party members by hitting the ‘Y’ button, and this is a key part of what makes Ys VIII’s combat so fun; switching is easy and instantaneous — meaning the next character will appear right where you were, instantly swapping places with your previously-controlled character — and can lead to all kinds of light strategy in your battle plans. In addition to their own skills, each character will deal in a particular form of melee damage — pierce, strike, or slash — and if you manage to hit an enemy with the type it’s weak against, it can end up in 'Break' state, toppled over and taking extra damage (among other debuffs). Beyond different attack types, characters actually feel quite different to play as well — from the relatively tank-like Sahad to the speedy Laxia — so hot-swapping party members is for much more than aesthetics alone. No matter who you’re controlling, you’ll also have access to some fun techniques that elevate the battle system above simple button-mashing. ‘Flash Move’ and ‘Flash Guard’, for instance, are Bayonetta-style moves that trigger if you manage to dodge or block an attack at the very last moment, delivering an incredibly satisfying slow-motion effect and a significant damage boost for the next few seconds. These feel fantastic to pull off, and they go a long way towards making battles feel more skill-based than stat-based; we managed to eke out a few wins over far more powerful foes with sequences of successful Flashes, and the rush was incredible. Other little wrinkles in the combat system further contribute to its personality as well. There’s a distinct focus on aerial attacks, for instance; it’s easy to juggle opponents up in the air, and finishing off foes while airborne will actually grant an experience point bonus. 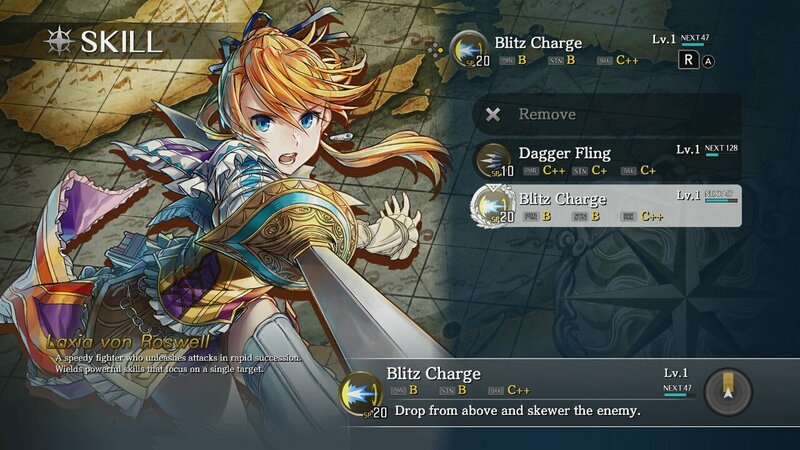 Similarly, landing a final blow with a skill (as opposed to a melee attack) will recharge SP, so tactical use of special moves can actually leave your gauge higher than before a battle. Setting off lots of skills will also fill up the gauge for an ‘Extra Skill’ — a character specific special complete with a bespoke animation and cut-in portrait that deals massive amounts of damage to multiple targets. Altogether, combat in Ys VIII is fast, frantic, and fun; deep enough to stay interesting, but simple enough to avoid ever feeling overcomplicated. 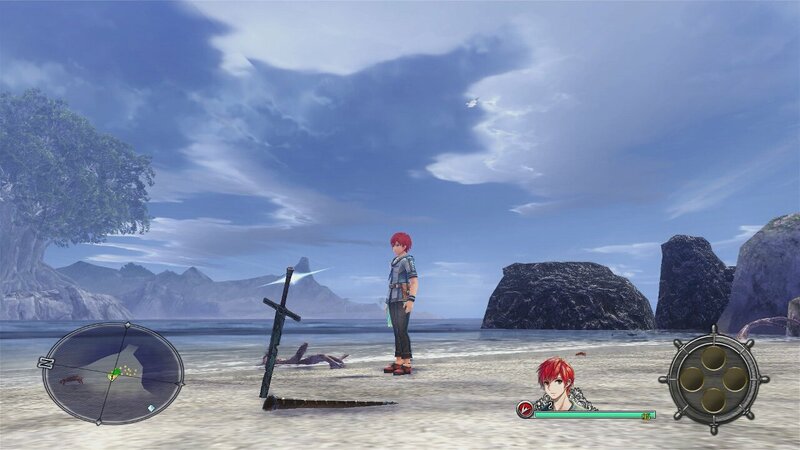 Of course, while Adol and friends will spend plenty of time defending themselves from the local fauna, the real goal of their adventure is to explore and map out the island, and that’s the other side of Ys VIII’s gameplay loop. As you set out from your makeshift home in Castaway Village, you’ll fill out Seiren’s map, noting down places of interest as Location Points. In addition to enemies, the landscape is riddled with resources, and by collecting fruits, plants, minerals, and more, you’ll be able to cook and craft new meals and items back at base camp. You’ll also come across new castaways, as you rescue the lost passengers of the Lombardia one-by-one — many of whom have special skills that they’re happy to share with you, by opening up new shops and services in Castaway Village. The village is a keystone of Ys VIII; it’s a place to rest and recharge, but you’ll also need to fortify and defend the settlement from beast attacks, which become more of a threat as you comb further into the island’s mysterious origins. Rescuing castaways will also allow you to explore more of the island, by virtue of having more hands to help move obstacles like boulders and tress blocking your path. You’ll also come across Zelda-style ‘Adventure Gear’ that fulfills a similar purpose, as items that will help you climb, or breathe underwater, or light up dark areas. Between all these elements, exploring the island quickly turns into an addictive cycle of gathering resources, returning to base, advancing the plot, and then heading back out to a newly accessible area to push further on. It’s an enjoyable loop — streamlined by generous fast-travel points — that places Ys VIII comfortably in-between exploration-based RPGs such as Etrian Odyssey and more story-focused series like Final Fantasy or Dragon Quest. And while this works wonderfully as a unique gameplay template, a large part of what makes exploration so fun in Ys VIII is the incredible environments — like Xenoblade Chronicles 2, this is an adventure with a world that’s truly worth exploring. The Isle of Seiren is a perfect setup, in that it gives the environment a strong cohesive identity; rather than having disconnected areas such as 'fire world' or 'ice world', biomes blend naturally into one another, and there’s a geographic sense of progression as you venture further out from your base. The setting also means Falcom gets creative with how to differentiate areas from one another by theme, and that really pays off; variations in colour palettes, lighting, verticality, and density work together to give each domain its own feel, and there isn’t one we wouldn’t want to see on a postcard. The Isle of Seiren is also lovely to look at in terms of graphics, and while it may not be pushing the limits of the system, Ys VIII still holds up very well visually. Character and enemy models are beautifully done, sporting impressive detail and smooth animation, and though you’ll spot low-res textures and low-poly features, the strong art direction and dynamic camera angles help smooth over these rough edges. Ys VIII started out as a Vita game before being ported to the PlayStation 4 and now Switch, and while those handheld roots are certainly apparent, so is the fact that a great deal of care went into its presentation, from costume design and the gorgeous 2D character portraits to the menus and UI. Unfortunately, that care is also why it’s extra disappointing that there’s a non-trivial amount of jank involved. The translation — which reflects the redone version patched in after the original Western localisation was widely criticised — is excellent, but it could benefit from more editing; scattered typos, extra spaces, and alignment issues appear infrequently but noticeably throughout. We also came across a few missing icons and images in tutorial screens, even in the very early game. Issues aren’t limited to writing, either; they also include odd design choices, like the fact that dashing makes characters control like wheeled vehicles rather than running humans, and that there’s no rumble effect whatsoever, which feels like a notable omission in 2018. Obviously these are far from deal-breakers, but they stand out precisely because the core game has such high production values. In terms of performance, we’re happy to say that this Switch port feels great. It looks excellent in docked mode, and while it can get a bit choppy in certain areas, in general it runs smooth and is lovely to play. The framerate feels much the same in handheld mode, with our only complaint being an odd issue in which the game seems to ‘lose focus’ for a bit from time to time — particularly in cutscenes — resulting in a blurry effect, sometimes accompanied by a quick camera shake, before snapping back to being as clean and crisp as it is when docked. It’s odd and annoying when it happens, but it’s definitely worth it to be able to take Ys VIII on the go. On the audio side, Lacrimosa of Dana delivers a knockout performance, with a stellar soundtrack that jumps genres from orchestral waltzes and Celtic-inspired folk to SEGA-style guitar rock without skipping a beat. There’s a wide variety of instrumentation and musical styles, but it all comes together as a cohesive whole thanks to recurring melodic and rhythmic themes and thoughtful transitions. Falcom games are known for their memorable music, and Ys VIII is up there with the best of them. There’s also excellent English voice acting, which helps flesh out the personalities of your party and most NPCs. With fun, fast-paced combat, likable characters, and an enjoyable story that takes full advantage of its beautiful shipwrecked setting, Ys VIII: Lacrimosa of Dana is a top-shelf action RPG. Exploring the Isle of Seiren is as rewarding as mastering the character-swapping, hack-and-slash battle system, and both fit into an addictive feedback loop of adventuring that keeps everything moving at a quick clip. Editing issues and inconsistent image quality in handheld mode are small blemishes on an otherwise polished production, but don’t let them deter you; Ys VIII is a true gem. Update: In our review, we stated that the game "could benefit from more editing; scattered typos, extra spaces, and alignment issues appear infrequently but noticeably throughout". NIS America has assured us that all of these issues will be resolved in a day one patch. 9? Ysy does it! I don't think I can go back to such plain looking environments after Breath of the Wild. A 9? Well, I'm certainly surprised. This friday's gonna be great between Aces, this and BlazBlue. Not to mention that big Minecraft Update on Thursday! Exciting week! Am hyped for this next week. Finally finishing up Xenoblade 2 (hopefully in time) so will need this to continue my RPG fix until Octopath mid July. Still haven't got very far in it but I absolutely love this game. Anyone who likes RPGs or Zelda should buy this. I've held off on getting the PS4 version, these sort of games just seem perfect for the Switch. I’m a little surprised by the score...is this really on the same level as Xenoblade Chronicles 2 (which was also rated 9)? @Jezebel95 Better because the combat wont put you to sleep. Great!! I really wanted to play this game, I've heard only good things about it. Can't wait to play it on the go! 2018 starts shining with this game, Mario Tennis, Crash Bandicoot, Octopath Traveler, and of course, Wolfestein 2. Best time of the year! Another great RPG I'll hold off on, just because my limited free time. Xenoblade Chronicles 2 was the other one. Right now I have too much backlog, maybe after BOTW and Skyrim I'll start buying these, and hopefully Ys VIII being a third-party gets on sale someday somewhere. But I don't usually like playing games that are sequels if I haven't played the previous ones. I know it's not important if plots are different, but as a huge Dragon Quest fan, although I've played IV-VII first, and hasn't been until now that I've played the original trilogy, I would have liked doing it I-VII. Yes, I own VIII and IX too, but their time will come eventually. Currently playing Y’s Seven before getting this. A bit conflicted on whether to go for the Special Edition although its £90. Also I think I read the artbook and OST are the same as the Vita/PS4 version that came out earlier. Thinking of getting this when it's 33% off. I have it preordered but no point of getting day one since it'll go straight into my backlog shelf. I honestly don't understand how people rate this so highly today. I played it recently for about fifteen hours on PS4 before dropping it. It's extremely dated visually and mechanically; movement and combat feels stilted, characters are paper thin cliche's, and the visuals are just so "flat". Comparing this to, say, Xenoblade Chronicles 2 makes this game feel like a hd-remaster of a B-rank RPG from the early 2000's. It's really dated. You’d think that the localization issue alone would knock a couple points off. Add performance issues to that and...yeah. At least the actual review told me what I needed to know. @Galenmereth I’m honestly just as surprised. Nothing I’ve seen of Ys VIII gives me “must-buy RPG” that Metacritic would have me believe it is. 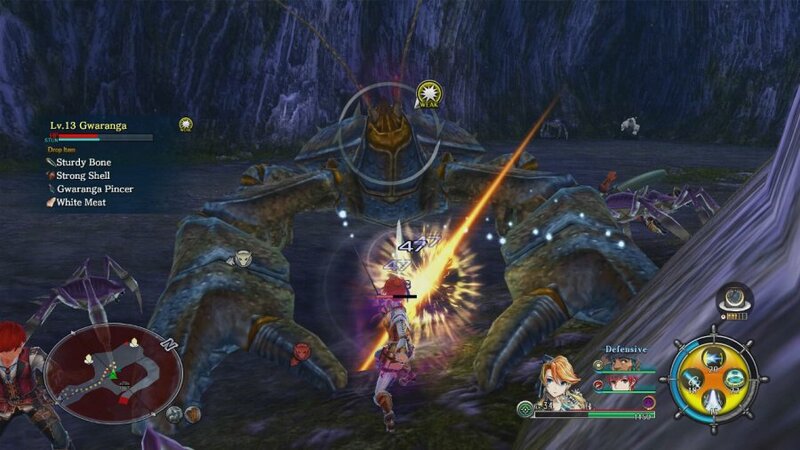 Xenoblade was also brought up in the review and it looks like a different class of a game. I don’t get it. A 9? I'm not sure I agree with that score... an 8, absolutely, but not a 9. I never know about Ys. I tried one of the Vita ones, and liked it for a few hours and then get really bored, especially found it repetitive, and many of the characters annoyed me. But I want to like it. It feels like I should like it. tempted to try again. Glad to see this get a great score - I have it on Vita and IMO it is the best game released for the little handheld (yes it beats persona 4 and Uncharted) Love it! Y's VIII runs at non solid 30fps on Switch while his PS4 counterpart reach 60fps. Another thing to consider, the price. 30 Euros on PS4 and 60 on Switch. Ooooh, even more excited now. I preordered the limited edition. I have all the other Ys games on my Vita, but was waiting on this due to the Vita version missing stuff compared to the ps4 version. While the Ys games may not have a high budgets as, for example, XC2 or BotW, they are really, really fun. And this one seems to further develop the battle system they switched to with Ys Seven and already developed further for Celceta. To be honest, in terms of how fun fighting is, Ys Seven and Celceta simply crush XC2 and BotW. Ys may be the only series where I simply love grinding. And the music... That's usually another incredibly high point of any Ys game. @Jezebel95 I'd say yes, but the two aren't directly comparable. As I've been playing through this, it reminds me of a PS2 era RPG in the best of ways. It's a bit like how Tokyo RPG Factory pays homage to 90's RPGs with it's games, but this feels more geared towards the early to mid 2000's RPGs. I think they nailed the aesthetic perfectly in just about every aspect of the game, but that also means that it might feel kind of dated by modern RPG standards. Regardless of what the score is to you, I haven't had this much raw fun with an RPG in a long time (not even Persona 5! ), and I would HIGHLY recommend. Preordered and still excited despite a couple of issues I've not seen discussed before. @bratzdoll It's one of those cases where I'm wondering if I've even played the same game I'm reading the reviews for. I just couldn't find anything redeemable about it, and it cost the same as any other new game does. It's confusing. Obviously subjective taste plays a huge part in the enjoyment of any game, but to this degree? Got it pre-ordered for the extra goodies. This is a late July game for me. I have them all and I love this series. I played it on Vita but decided I wanted it for Switch. I'm not surprised by the review, it really is a great, fulfilling game. @Galenmereth "this game feel like a hd-remaster of a B-rank RPG from the early 2000's. It's really dated." That's not a bad thing, it's a bonus, it's the sequel to Skies of Arcadia us Dreamcast owners have always wanted, and it looks a lot like Grandia 2 to boot. ☺ Though I'll admit after playing the PS4 demo and really enjoying it I couldn't with good conscious give this more than an 8. And it should be $40, not $60. Though I suppose that's a wash as no $20 or $30 season pass. The 25 DLC items look pointless. @Cobalt 30 euros on PS4? I'd been holding off on pre-ordering the Switch version b/c Sony has a habit of putting games on sale when late ports release on Switch, but this has always been $60 in the US. I check US PSN sales every week as I have PS+. I was waiting until today to see if it went on sale. Is 30e a sale price or has it always been that price? It's not listed in this week's sale either. Have this ready to pre-order on Amazon, I can do $48 with Prime, and the map looks nice. Though I'd get the PS4 version for $30 if I could. @Jezebel95 I'd say it's actually better then Xenoblade 2. Awesome. I'm waiting for Octopath Traveler but I'll try picking it up when I have the time! "Ease"? I've been calling it "Wise". Though it's more like "Why's". In my defense I originally thought the title had an apostrophe, Y's 8. I assume this is 60fps on the Switch? It's a Vita game, so anything less wouldn't be acceptable. I passed on this on the PS4 despite it recently being on sale for next to nothing. It just has that look of a very low budget game about it, which is common to pretty much all Vita RPGs. I'd much sooner have a richly detailed 2D presentation over naff looking budget 3D. Interesting, I have been watching for this. I'll have to keep it in mind but with Octopath and N-sane Trilogy over the next few weeks this will be something I pick up down the road. I hope this series gets the welcome back reception it deserves! Getting this for the Switch since I don’t really play the PS4. This is the only Switch game I’m getting this month. Glad it got a great review. @bolt05 I couldn't finish Xenoblade after 33 hours because of the exhausting combat system. Pumped for this game! @Cobalt Thanks, guess I'll look around retail a bit this week. I'm currently playing through Memories of Celceta and Ys V. I am undecided as to whether I will play this one next, or play VI and Seven first, but glad it is another cracker. @RealDanStrauss yeah I gave XC2 a good go too, but one day just hit a wall and I can't see me ever playing it again. The combat is crap and it has the worst map/navigation I've ever seen in a game. Does movement still feel very floaty? Or as floaty as it looked on the multitude of videos I’ve watched? With this review... I may be regretting that cancellation! @moroboshi It's only 30 FPS on Switch, I'm surprised the review doesn't mention that. @rjejr "and the map looks nice"
No complaining about price then. Didn't make sense to me back when I originally saw it on store shelves way back when and I have no idea how I originally learned (falsely?) that it was "ease". Then, there's the issue of how someone from Japan, like the creators of the game, would pronounce it. A transliteration of the city name that I'd be incapable of figuring out myself. I saw an unconvincing video saying it is "Yeez". So, anything but "whys" I guess. How about right from the early CD version of the game itself (at 1:35 - 1:38)? Also, I think the Japanese pronunciation would be something like i from "in" followed by a shortly expressed vowel sound like the oo in book? So quite differently, but also, I'm out on a limb with that. Next Tuesday can't come quick enough! I've been craving a good RPG for a while now and I can't wait to play this! @Alto It's precisely as floaty as it looks, trust me on that. The whole game feels pretty "cheap" to play, which is one thing I never see mentioned in reviews. I also don't understand how people find the maps nice; they're really bland with very little environmental detail. Maybe it's because I've not played a single Falcom RPG before? So I don't have nostalgia to compare it to. I don't know. Compared to contemporary RPG's like Xenoblade Chronicles 2 and Ni no Kuni 2 (my most recent ones), this was extremely disappointing. @Galenmereth thank you for that clarification. I remembered also that I did play the demo on PS4 to see what it was like and yeah it seems to be very cheap. I’m sure once you look past that floaty feel and stuff it is a good game overall I just notice that stuff too much I guess. I noticed it right off the bat and gave me a sour taste for the rest of the package. I may actually opt to get Xenoblade now especially with that expansion that was announced. I still really want an RPG like this with real-time combat but I’d love it as a much more tight system. Also I would LOVE if Ni No Kuni came to Switch! 1 or 2! Now one of the best games on Switch. I loved it when I played it on PS4, and convinced my brother to get it for Switch. I might eventually pick this up on switch, I have it on PS4 and Steam (the new translation is much better).. Ys is one of my favorite series, and this one comes close to my favorite of the series. Slow start, by the end the OST was on my playlist. I love these games with a PS2 aesthetic. Pre ordered the moment it was announced. Another reviewer I follow said that he found the characters and enemies in this game better than Xenoblade chronicles 2. Actually the only gripe he seemed to have was the environments seems kind of poor for what the switch can do but otherwise he really loved it. 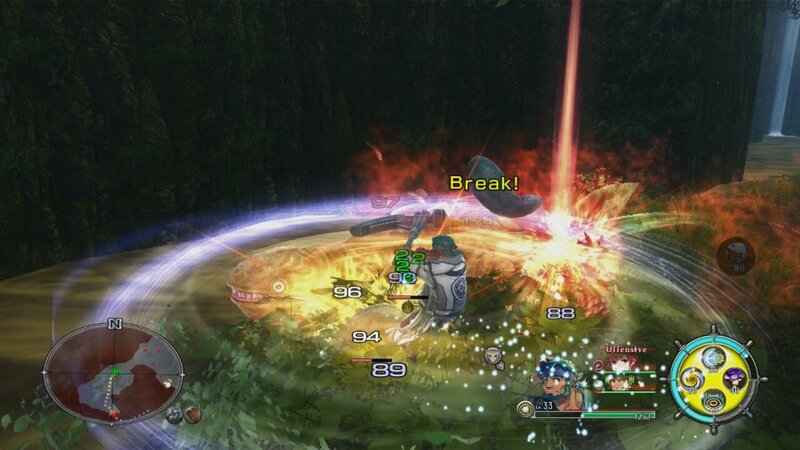 I know when I see combat for this game it appeals to me more than what I've seen of Xenoblade. @bratzdoll It depends on what you value in an RPG. I'd say it's more a different style rather than a different class. What it does, it does really well. Exploration and combat were fun throughout, and it's paced in such a way that you're never stuck in a cut-scene for too long. When I played on vita, it hooked me in a way that few games do these days. That said, I'm analyzing the value at the <$25 price I paid. Nearly triple the price to get the little bit of content not on vita seems...excessive. So glad to see this on Switch, albeit with a few compromises. I'm more excited for this than Xenoblade Anything, to be honest. I've been waiting for the chance to rejoin Adol in his adventures again and looking forward to this. Off topic, I found the Shining Resonance Refrain demo to be another potentially enjoyable Action RPG... If that reviews good, I'll be in Action RPG heaven. I have been going back and forth in my head as to whether I want Xenoblade 2 or this game and to me the choice is clear, I much prefer action oriented combat over the turn based gameplay of Xenoblade 1. I will be adding this one to my library as soon as I can. @gcunit this a a vita port, lol. BOTW is a Wii U port. Be sure to tell your friends how much you love the Wii U! @Buttoholic Don't you worry pal, I sure do tell them. I have 3 of them you know. Probably won't pre-order this--I'm still working on Hyrule Warriors, a friend just lent me The Last of Us for my PS3, and Octopath Traveler awaits--but I will definitely pick this up in a couple months. Finally NL acknowledges this game! I adore these games. Yes they are archaic, but that's kinda the point. An 80s style rpg with updated but still retro graphics? Sold - although seeing as I have most of the titles that's a given. @gcunit good. Wii U was great. I keep telling people the Switch is a Wii U port. @aaronsullivan So, "geese" without the G? Eese. East w/o the T.
It's not a hard "s" like in "ease" which sounds like a "z", it's a soft "s" sound in ease. I haven't watched the vid yet, 1 email notification at a time. Watched the vid, sounded like "Geese" w/o the "g". Well at least how I pronounce geese, could be pronouncing that wrong as well I suppose. I kind of like the spelling of Eese, though I would probably pronounce that "essay" if I saw it. Though more w/ a Mexican homie accent - "'hey, essie, what's shaking holmes." But now I'm leaning towards skipping it an playing KH 1-6 as a family taking turns. @Cobalt I've been looking around, found a shady looking website for $39.99 but ti's still mostly $59.99 everywhere on PS4 retail and on PSN. So I'm leaning towards just playing my Kingdom Hearts 6 pack instead. That should take all summer at least. Loved this game on PS4 and preordered the CE from NIS store. I'd love to see more Falcom on Switch, and hopefully we don't have to wait 8 years for Ys IX. I liked the subheading for the review too, even though it may be too ch-ys-y for some. @DownRightSam That's good to know, don't get me wrong I am interested in Xenoblade 2 as well but when deciding which one I want to play first I have to give the nod to Ys VIII. @Skorpion24 I'm definitely thinking about getting the PS4 version (when I eventually buy a PS4) after the 30fps comments. @RealDanStrauss i tries to get into xeniblade after reading old wii reviews, so i bought it on 3ds and the guy in ebgames said, oh you like this, i cant play it the combat is so slow. I said, are you joking this game is a jrpg hit.. lasted about an hour before i took the game back. Promptly skipped the wii u xenoblade. And never even considered 2 on switch. People who can play xenoblade games have more patience and time than i. Is this the same game that released on vita a few years back? After NYC sale-tax the Amazon pre-order discount is really only $8.40 for me. @BongoBongo123 Yes... This has some of the PS4 content that was not in the VITA version. Bought a $50 eShop card on Target.com for $47.50 - Redcard 5% discount - to buy Mario v Rabbids Gold for $43.99 thinking I saved some money and had a few $ left. W/ tax it was $47.78, so more than the $47.50 I paid. I still have $2.22 left but that's only 1/3 of the $6.01 I thought I would have left. So tax ate up 2/3 of my leftover money. 2/3 sux. I'm not in NYC anymore I'm in Suffolk, it's 8.675%, so $48 on Amazon w/ Prime is $52+. That's the wrong side of $50. Does anyone know if this is getting a digital release? The game looks really dated, kinda has that PS2 JRPG vibe. You right it was $52.25, I canceled it. So, $14 (hollow Knight) +$17 (yakuza 0) is way on the right side of $50. And I have 2 good games till Shining Resonance comes out next month. And that is 43.54 total - and I played the DEMO on switch. SO no surprises. I love the Ys series. Day one for me. @rjejr I always thought it was pronounced ees, as in geese. Close to ease I guess but with an s sound and not a z. @FX102A I have had a few NIS limited editions and have stopped buying them as I have largely been disappointed every time by the print quality. 30fps? My poor eyes! This is technically unplayable! @Agramonte "This game is cursed." Yeah it might just be for me. It went from Day 1 to Day never right quick. And that was after the review gave it a 9. Though since I've been watching if it's $29.99 on PSN next Tuesday I'd probably download it. @Nomad "ees, as in geese"
Of course I would finally figure out how to pronounce it right after deciding I wasn't going to buy it. I dunno... this game looks a lot like Shining series from the PS2 era. "While it leans on plenty of familiar plot lines and anime clichés"
Yeah, that's all I needed to decide it's a pass, especially since this is the main reason I never got far into Xenoblade 2. Bizarre. Sloppy port, I'll pass. Anyway comments section, I am sorry I have to leave you but I must buy a hat. This is the pathetic result of the gaming world of today ! Yeah, the gamers because they are "the WHY" this happen. It's an utopia but I dream of a day where players will realize how better it was some decades ago. NO DLCs, NO LOOTBOX, NO PATCH, JUST A GAME COMPLETE AND FINISH ! @Agramonte Hey thanks for thinking of me and putting all that here. Whats' crazy about that is the game has been out on PS4 since September, nearly a year, so they shouldn't have had that much to work on. And I know I'm a nutcase but that many updates has completely turned me off getting it Day 1. I showed your post to my wife and she basically just shook her head and walked away, after telling me to buy it on PS4 instead. I'm still expecting a PS4 sale either when this releases or when patch 1.04 updates in mid July. By which point I may be playing Shining Resonance, I like dragons and it's $40 on Amazon w/ Prime. Probably get that on PS4, I just can't trust 3rd party stuff to run as well on Switch. And I don't play anything in handheld mode, 52" 1080p > 6" 720p. @Cobalt yeah, well you already found out - those same gamers will just make excuses for it. This is the norm. @rjejr 😁 no problem! - I should have done what she said 12 months ago. Yep... I already moved my pre-order to Shining. I'll re-visit this at the end of July. One of my favorite series of action RPG. I have all the Ys compilation on Steam and PS Vita. Pre-ordered since day 1. Wait for delivery now. Graphics is not always this series strong point but action. Switch is the most suitable platform for level grinding. @Dpishere xenoblade 1, x, and 2 are all action RPGs. There is no turn system. Picking this up. Not expecting it to be as great as Xeno 2, but that is to be expected. @Trajan It is an active time based system, action rpgs are games like Kingdom Hearts and Diablo 3, any game where you don't directly control the actions of your characters isn't an action rpg in my opinion. Xeno 2 does strattle the line though, it is unique. I was ditching this one from the start based on its tittle. Who would play a series 8 game for the first time, even worse in the case of and RPG. Luckily I decided to read this article. Sounds too good. I still have backlog to finish. Hopefully this will go on sale in the future. @Dpishere yeah having gotten this, it feels more like Bayonetta. Not bad, but not what I was expecting. @rjejr Skies of Arcadia? I'm in! From the comments here, I guess I'll give up on hoping that Skies of Arcadia will ever be ported to Switch. Yeah, the graphics aren't realistic like BOTW, but the wonder, amazement, and humor have been missing for a long time in gaming. I will definitely take the plunge on Ys VIII. Thanks!!! @Alto Ni No Kuni 1 or 2 on the Switch. Yes! Heck, port the DS version of Ni No Kuni and translate it for us poor folks who don't speak or read Japanese. @Thulfram I skipped YS 8 and everything else for Ni No Kuni 2. I played the first 1 about a year ago and my entire family watched, and we've bene looking forward to 2. I held off on buying it 3 months ago due to the $20 season pass but it was on sale for $35 which was too good to pass up. @Agramonte So after all of our JRPG discussions I wound up buying Ni No Kuni 2 for $35 new on disc. I may finish it and trade it in before they even announce what's in the $19.99 season pass, so I'm just pretending there is no such thing. @TromaDogg Thanks for the tip. Honestly I’ve been away from the FF series because I’m lazy. Is like staring to watch Breaking Bad, there are tons of seasons so I pass. If that one is stand-alone entry, I’ll give it a chance. Welp, got the game (ce) and I'm literally dead to the world for a few weeks. I'll be lucky if I remember to eat. Very deserved 9 on fun factor alone, though if you're expecting AAA polish, nope, these games are never much for high budgets. This really is a fantastic game. Highly recommend people pick it up on PS4 if you own both it and a Switch but it's a decent port for Switch as well. I trusted this score and bought it. There is no way this deserves a 9, it’s a 6 at best. Loading every 50 feet you walk, GameCube-like graphics, nothing about it is close to a 9.